On amazon.com, the search box searches only for products that amazon sells. Obviously, this is a conscious decision made by amazon for some reason. However, when it comes time to search amazon for something about the site, rather than a product, things become very tough. For example, you want to find amazon's return policy. Type return policy into the search box, and you get a list of products. 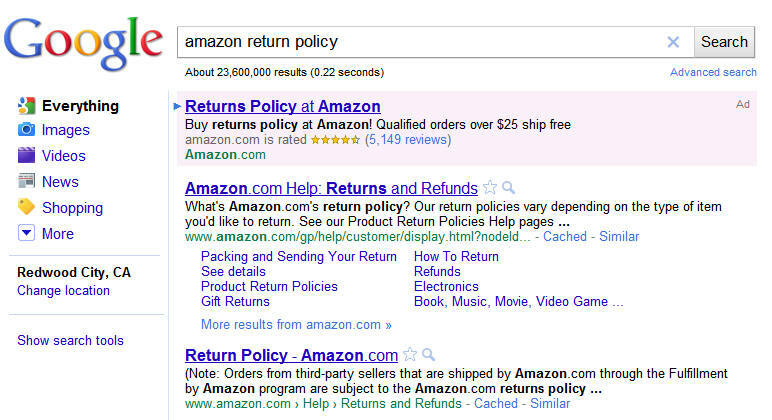 I'm not the only one to try this, as the "Related searches" pulls up things like return policies for amazon, return policy for amazon, return policy for amazon com. Helpfully, in this case, amazon has now added (I think recently) the following: Trying to find the online Returns Center or our returns policy. 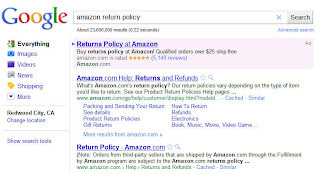 But type "amazon return policy" into Google, and you get an amazon Sponsored Link that takes you to the wrong place, but the top of the search result list takes you to the correct place. I remembered seeing a list of the Kindle's Most Highlighted books, type the term "kindle most highlighted books" into amazon.com, and not helpful at all. Type that term into Google, and you are taken to the correct place.